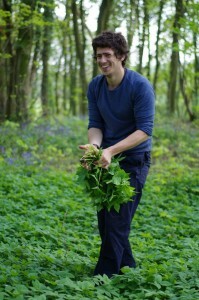 Join us on a full day of foraging and wild food cookery with professional forager and author of ‘The Foragers’ Cookbook’ James Wood. After our initial meeting we will go through some keys to help you in the correct identification of what we’re about to find. Along with your very own foragers baskets we will head out to discover the vast array of wild edible species that lie all around us. James will give you tips on correct identification, potential look-alike species as well as a vast range of edible possibilities that the species can provide us with. Take all of this in whilst enjoying a large range of pre-made wild food tasters. Including jams, pickles, syrups, chutneys, cordials, alcohol infusions and salt pickles. You will then take on the role of the forager and harvest a range of wild and fresh ingredients. On returning to our venue we will have a quick break whilst sorting through and cleaning up our ingredients. Then we start on the cookery side of our course. Help will be on hand to guid you through the cooking process. Chopping, boiling, baking and mixing our wild ingredients to create a delicious meal for us all to enjoy. At the end of the course you will be given a little portfolio for you to take home. This will contain basic foraging information and the recipes from the day . Light Lunch and refreshments provided.